This was the opening line to an email I received from South Africa, asking for help in finding someone’s military records. I am frequently asked to find a soldier’s records, so this request seemed fairly straightforward. His name was Frederick John Stevens, and he had served with the British Army during the Second Anglo-Boer War (1899-1902). He was born in England between 1870 and 1872, possibly in Eastbourne or Newcastle. Frederick married Helen Nyman and remained in South Africa after the war. Veronica’s father was one of Frederick and Helen’s three sons. Veronica was desperate to learn more about her grandfather and get his birth certificate, but his vital details were scanty and unverified. She had photos of her grandfather in uniform, which proved helpful. 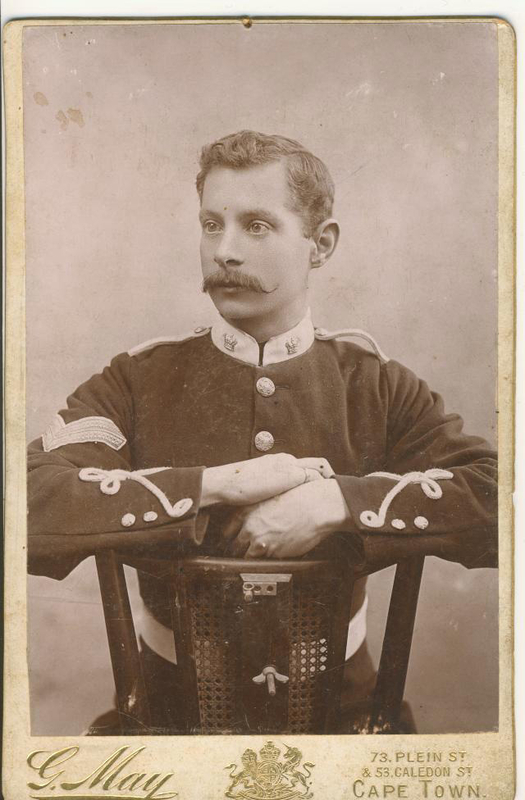 Based on the collar badges visible in one of the photos, I identified his regiment as the Army Service Corps (ASC). My goal was to locate his military records—a solid first step toward finding more about her grandfather. I expected no difficulties in finding his records, or learning enough about him to be able to get his birth certificate. I had no inkling of where this search would ultimately lead. Late 19th– and early 20th-century British service records can be a good source for such biographical information as age, place of birth, and next of kin. A single man usually named his mother as next of kin but sometimes named his father. Crossing my fingers, I searched the British Army WW1 Service Records on Ancestry.com. Even though Frederick served before WW1, records for those who fought in the Boer War are often included in the WW1 series. I was in luck. Fortunately there was only one Frederick John Stevens who served with the ASC. The records stated that he was born in Pimlico, London, had enlisted in 1889 at Aldershot when aged 19 years and 6 months, and had served in South Africa between 1895 and 1902. His occupation was a draper’s assistant. From his enlistment date I calculated his birth date to be around January 1870. This assumes he knew his actual age and that he told the truth! With great anticipation, I checked to see who was named next of kin, expecting to see the name of a parent. It was not his mother or father, but his wife. However, I could see something else had been written in, but it was struck through. I could barely make out what had originally been put down as next of kin when he was enlisted as a single man: Sister, Annie Stevens, Bishops Road, London. What a disappointment. I would have to find out his parents’ names some other way. How exciting. Have you checked out this site? http://www.forces-war-records.co.uk/default.asp. You have to register, but it is free. There is, however, a premium subscription, but I can’t figure out how much it is nor what more information you could get from it that you wouldn’t get for free. Worth a shot. It is very clear (especially the Terms section, which I’m sure as a technical writer, you will appreciate) and the tutorial is good. Looking forward to Part 2. I have an account but I never went as far as getting premium information. The site has evolved a lot over the years from what it used to be. I’m not sure if there is any more there that I can’t get already from Findmypast.co.uk, Ancestry.co.uk, and The National Archives. An annual subscription is £44. I honestly don’t think you get a soldier’s actual service records, but they match up a person with his regiment or unit along with what that unit did during a particular war. But I’m not really sure!